The last couple of days have felt very much like spring is just around the corner. Warmer, longer days with stronger sunlight, and even a little mud are reminders of what is to come. Maybe I’m just daydreaming too much. The reality is that we could be thrown into some very cold weather at any time. This weather does get my gardening blood going, though, with visions of those plants that will be the earliest to show, emerging from the previously frozen ground. Soon we’ll be checking daily to see which one it will be. 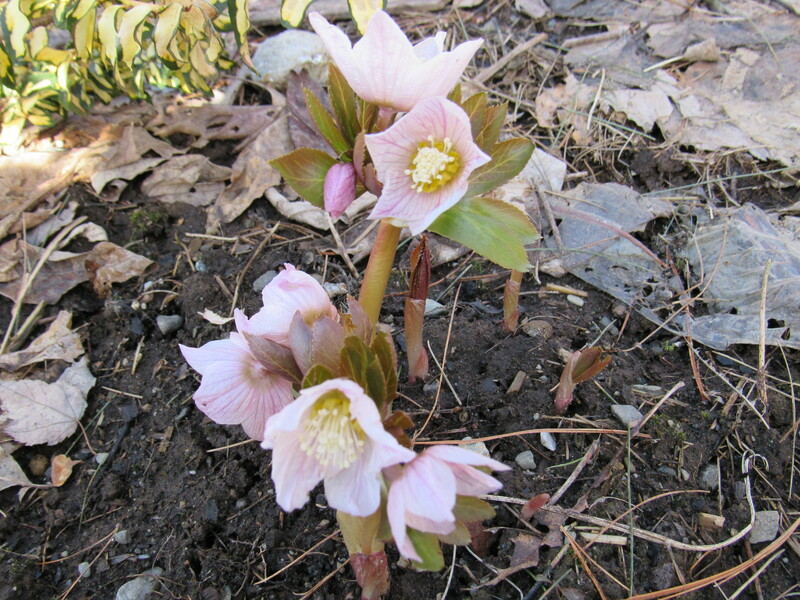 Depending on the location in the gardens and the amount of snow cover, we have had springs/winters where the first plants are up the beginning of March. Though welcome, it is not always a good situation for the plants if a real cold snap follows and hopefully, that won’t happen this year. Unfortunately, many of our customers do not come to the nursery early enough to see the real early risers and spring ephemerals. In developing a list of talks and presentations in our new studio, we thought it would be informative and fun to have one on the earliest of plants that grow and bloom in our gardens. It is a great time of the year for plants other than the traditional spring bulbs. So watch for this and other talks we are planning to have this year. The winter will eventually end and another gardening season begins. 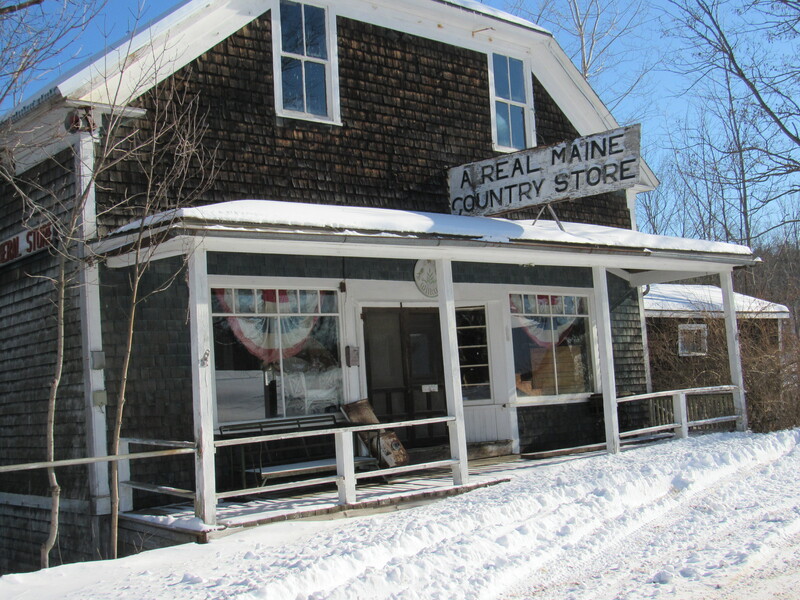 If you are passing through the more rural parts of Maine, it is very likely that you will drive through some of the old villages that once supported its thriving communities. The old buildings are still there…the town halls, the Grange, the mills, and the old country stores. 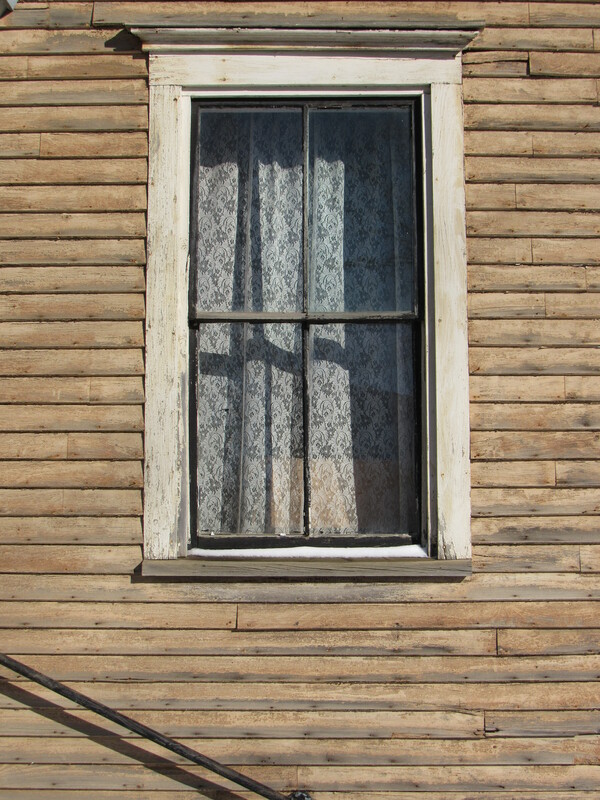 Some are still in use, some are being restored, all of these old buildings remind us of days gone by. My old friend, Elmin, would often tell me some of the stories and the history of when these little ‘in town’ communities were bustling with activity. I would sit listening as he spoke of bringing his grain to the mill to have it processed or about their weekly visits to the general store for supplies. Many of the old time stores held ‘accounts’ or ‘store credit’. In other words, they would record the items you bought in a ledger and you’d settle up with them at the end of the month. A general store back then might carry all the things you’d need for stocking your kitchen pantry, but also have on hand some twenty-penny nails or a shearing pin for your hay baler. At the town’s center there would be a post office, perhaps a bakery, a butcher shop, a blacksmith, and most likely a cobbler. These businesses were often the center of the community, a place to socialize and where most would travel for their week’s trading. One can imagine a giant wood burning stove fixated in the middle of every general store where you could count on seeing a small gathering of folks warming themselves and catching up on events, news, and local gossip. So many of these little towns are less active now. 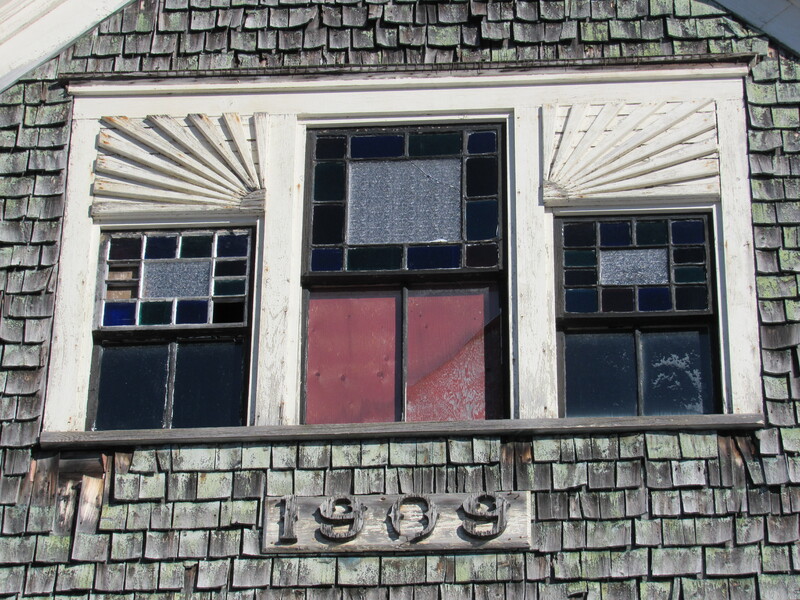 The buildings are often in need of great repair and the people who remember them being of use are no longer with us. Too bad, really. Now people travel 15 miles (or much further) outside of their own community to purchase what they need, and some would consider these ‘outskirt’ towns to be their community. It’s where they do most of their socializing, their buying, and to attend events. I’m an advocate for staying close to home. 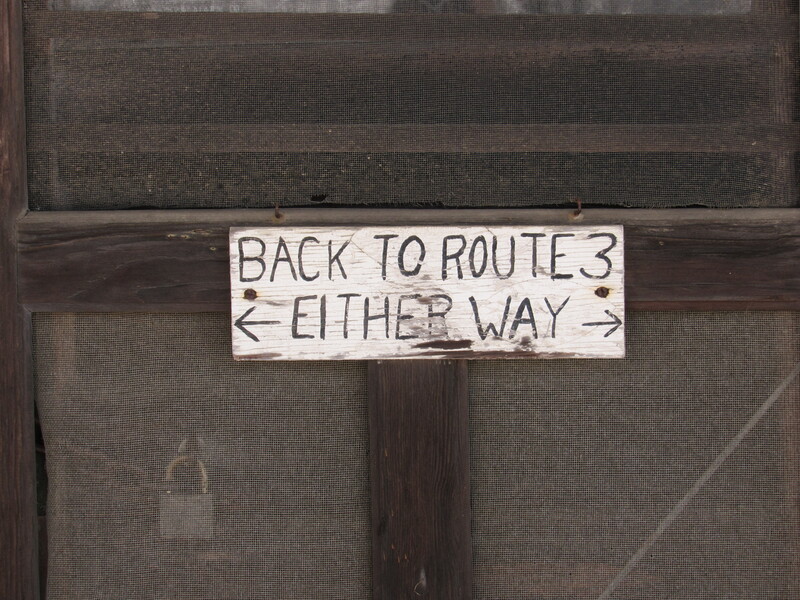 Our trips to ‘town’ are infrequent. We are lucky to not need much in the way of food ( so much grown and preserved here), and the people we connect with, for the most part, are our neighbors. We feel a real fondness towards these little villages that remind us of simpler days, of a time when your needs really were met by your very own town and community. For me, I don’t love driving or even being in the car for extended periods of time. We usually plan an outing so that we are minimizing our time behind the wheel. A trip into the town that’s 15 miles away may only happen once every two weeks, and even then I groan at the thought of leaving home ( my neck of the woods) to brave the big city, which by the way is not a big city at all, just a slightly larger town with a few more amenities. In my mind and heart, I dream of us all breathing life back into these little village centers. I imagine what it would be like if we could recreate those shops and mills and useful places. I would be more than happy to trade and purchase wears within a downtown made up of neighbors and friends. I think this camaraderie of trade and truly local economy makes sense. And don’t these grand old buildings, these icons that harbored such purpose back in the day, warrant some TLC, some special attention, some revitalization? I think they do. Well, while wandering a bit not far from my comfort….our great but humble town of Montville, I took some pictures of the village of Palermo. Branch Mills, to be exact. Years ago, Montville folks would have no doubt harnessed their horses and hooked onto their wagons to do some business in the little neighboring town of Palermo. Here are just a few photos….. It is now cold. It hasn’t been. We’ve been spared up until recently. But now, winter as we know it has arrived and is settling in, and behaving as it should. For the first time this season, the wood pile is showing signs of our frequent hauls, the animal’s water buckets freeze several times throughout the day, and the car engines groan when we start them. I was starting to worry that winter had passed us by. I’m sorry that I had to say that. You’re probably wondering what kind of person would cheer on the cold, the snow, the ice. Well, that ‘kind’ of person seems to be me, I love winter. It’s o.k. if you think this is weird ( I’m certain I’ve been considered a lot worse), but as this season has ticked by with its balmy weather and high temperatures, I have had this gnawing feeling that winter, real winter, wouldn’t show up. What about ice fishing?? 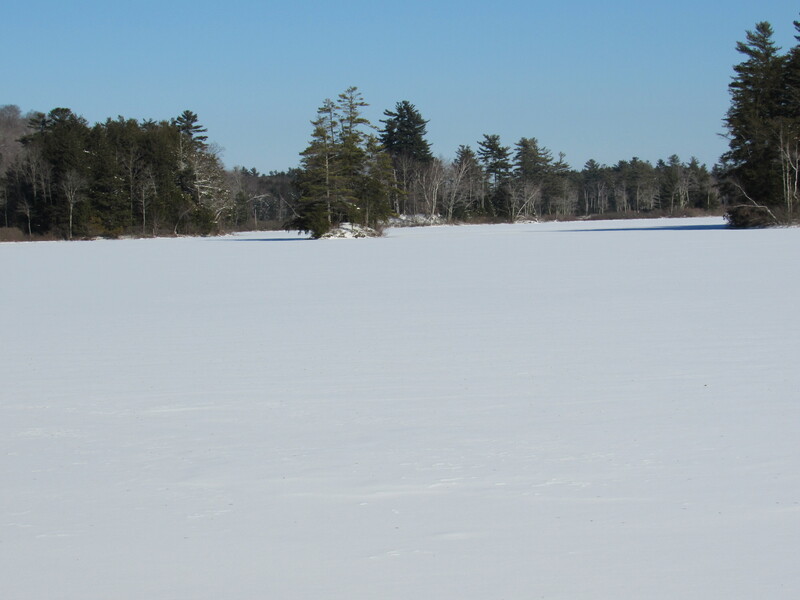 So far, the annual ice fishing derby has had to be postponed twice for fear that the ice wasn’t thick enough. Not Right! Pond hockey? Those days in mid-January when you gather up a bunch of skaters and assorted sticks and head down to Kingdom pond for a few lively games, we can’t miss that! And let me just say, that no winter would be complete without a ferocious ride through the sheep fields on our flexible flyers. Then there’s knitting, spinning, soup making, and all of the reading to consider. A very long list of activity, restorative activity that is, to be enjoyed during the cold winter months. I know winter can pose some problems and inconveniences. The traveling can be treacherous. Pipes may freeze. 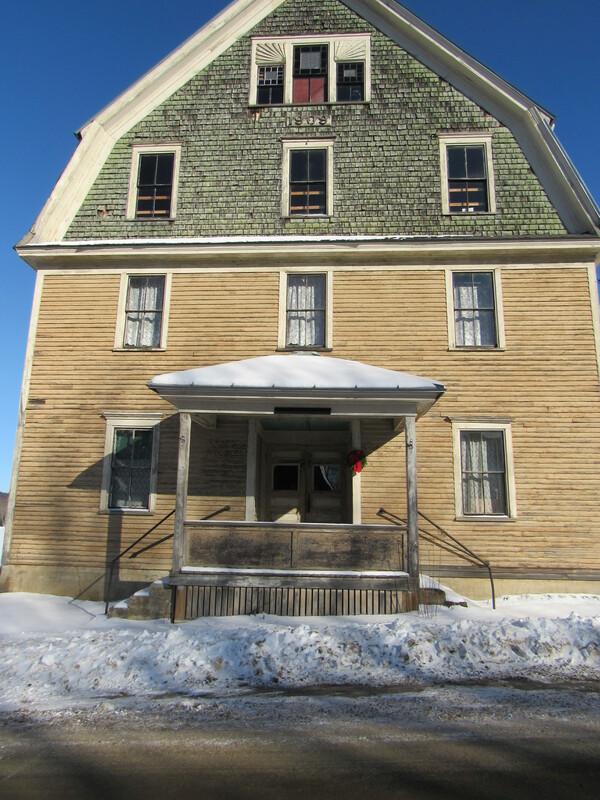 The snow and ice can accumulate on the rooftops and cause problems. Then there’s the possible threat to the landscape when ice or heavy snow builds up and damages trees and shrubs. We deal with these too and groan along with everyone else when these situations arise. However, in my little ‘I love winter’ heart, I’m taking it all in stride. Accepting winter for what it is, brutal sometimes, difficult, asking us to rely on our hardier selves and brave the cold, snow, and ice. How do you survive the winter? With cheer or with dread? Or maybe a little of both? Many of my friends say I have no business promoting the greater aspects of winter, they suspect that I may have been a reindeer herder in Siberia during a past life, and this distant life keeps creeping in when the sun is at the southernmost point of its journey. Maybe. I suppose anything is possible, and so, please bear with me as I enjoy my ample dose of winter! 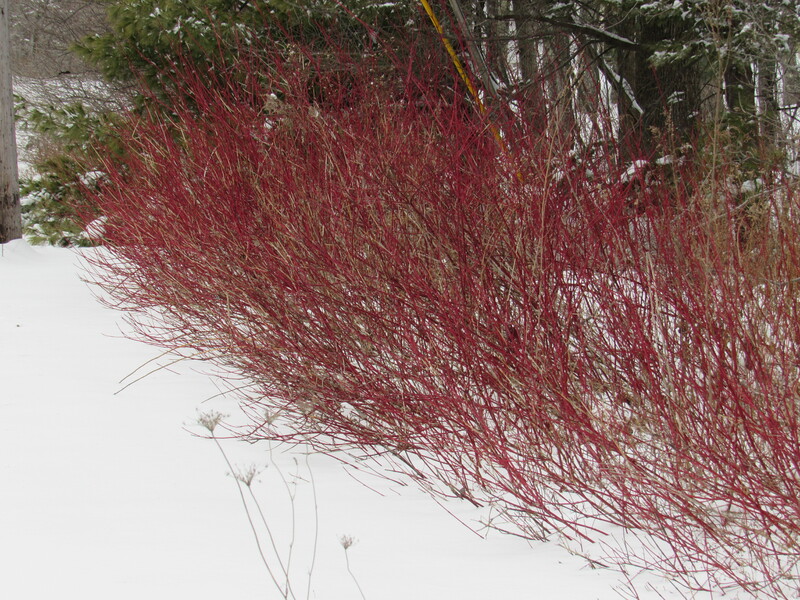 I’ll leave you, as I go out to stomp on the bottoms of frozen water buckets, with this poem by Wendell Berry…..
Cornus sericea, or Red Twig Dogwood ( also called Red Osier) is a native shrub that really stands out in the winter landscape. Driving around the countryside, you can spot the bright red stems quite easily at just about any speed…. not that we suggest that you drive around speeding to test this theory. Large stands of this suckering shrub are very common roadside, especially where drainage ditches have been made and water is available for this moisture loving plant. In the wild this dogwood can reach 6 feet or more. Coppicing and thinning in the garden will keep them shorter and the color richer. Flat-topped white fragrant flowers appear in May and June followed by white berries later in the season. The flowers attract many pollinators including butterflies. The berries are food for birds and other wildlife. 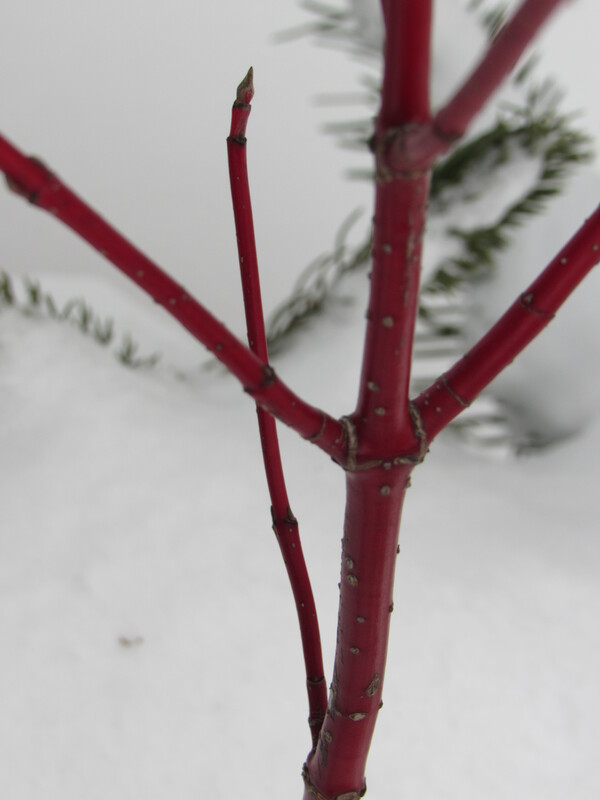 Spreading by underground stolons, Red Twig Dogwood is very effective when used for erosion control. In the landscape, its main attraction is for its colorful branches in winter, and they are often collected for decoration in seasonal arrangements. Some cultivars such as ‘Cato’ have yellow stems while ‘Flaviramea’ has lime-green stems. Another, ‘Ivory Halo’ has variegated leaves giving it a longer season of interest. There are many cultivars on the market now having various shades of red, yellow, and green stems and also differing in height and spread. Almost all have better color when grown in full to mostly sunny sites. Cornus sericea is an easily grown native with many uses and types to choose from. We’ll be featuring several varieties, including the native of course, here at the nursery in the spring. Consider adding this great, Christmas red, native to your landscape! 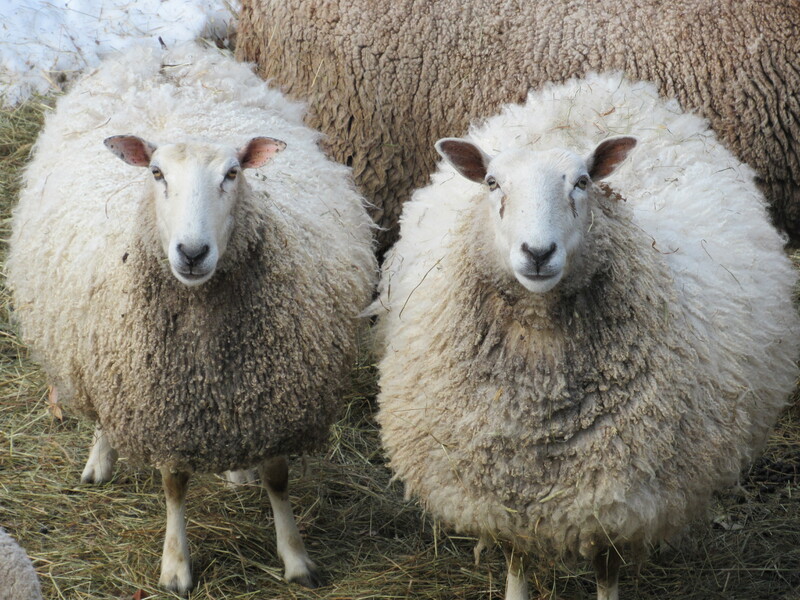 The sheep (and their shepherd) here at Fernwood would like folks to know that we have a winter yarn CSA available ( CSA- Community Supported Agriculture). Purchase a 3-month membership and we will send you a skein and a ‘one-skein’ knitting pattern each month. Beautiful, hand dyed, soft and lustrous skeins of yarn from our flock of Blue Face Leicester sheep. Though it hasn’t been one of our coldest winters on record, and perhaps there has been less need to bundle up in woolens, we do hope you’re still finding an opportunity( and reason!) to knit. 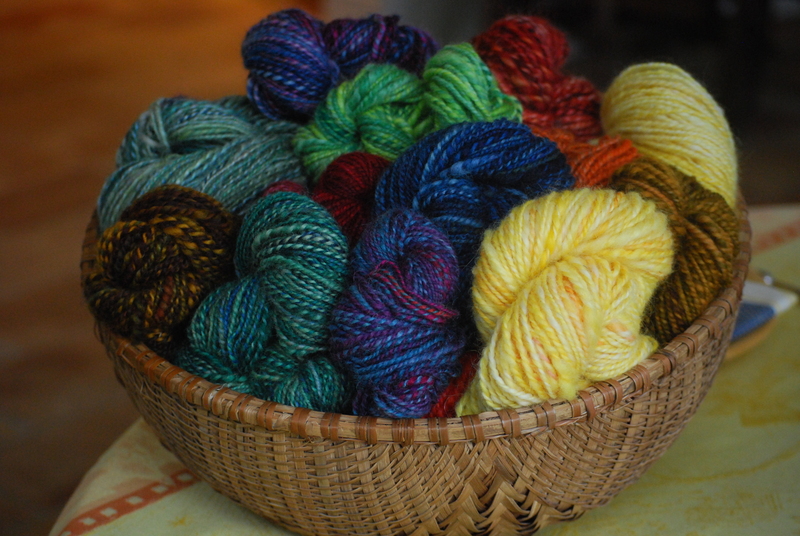 If you are interested in Fernwood’s Yarn CSA and would like more information, email us please and I will promptly send along all the details. Thank you and stay warm! 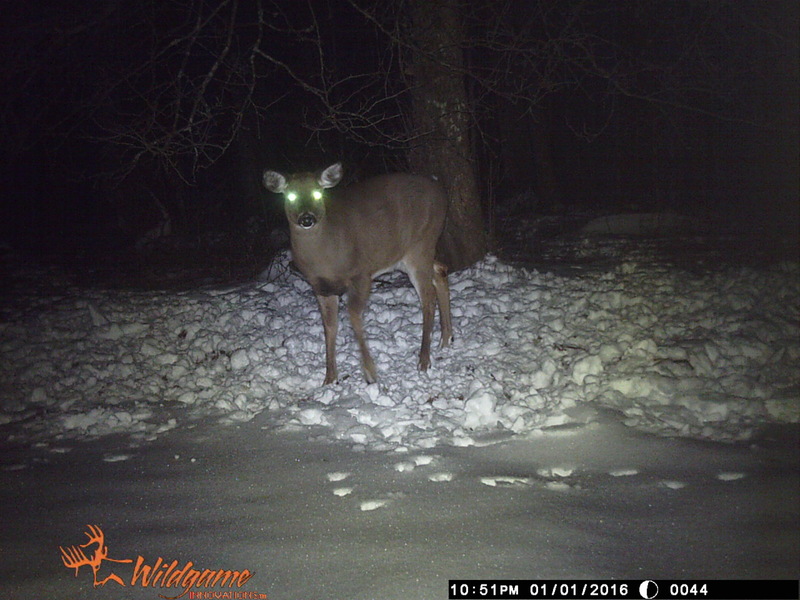 After our post about the deer coming a little too close to our livelihood and helping themselves to a few choice plants, I thought it may be time to explain why this is really happening. I know we mentioned in the last post that we no longer have a good nursery dog. This doesn’t mean that we don’t have any dogs here, or that they aren’t good dogs. We have two at the moment. Miller, our big loveable, goofy Lab, and Lucky, the mixed breed that came to live with us after our daughter rescued him from being perpetually tied to a porch post. They are both wonderful dogs, we love them, and one of their all-time favorite things to do is to greet customers who come to the nursery. They’re good at this. They take their job as ‘greeters’ quite seriously. They get paid in extra love and pats from the many people who find them irresistible. But let’s talk about our old dog, Boreal, who we lost this last summer. He was fifteen, had terrible arthritis, and began developing tumors that we were fairly certain to be cancerous. He had a difficult summer. 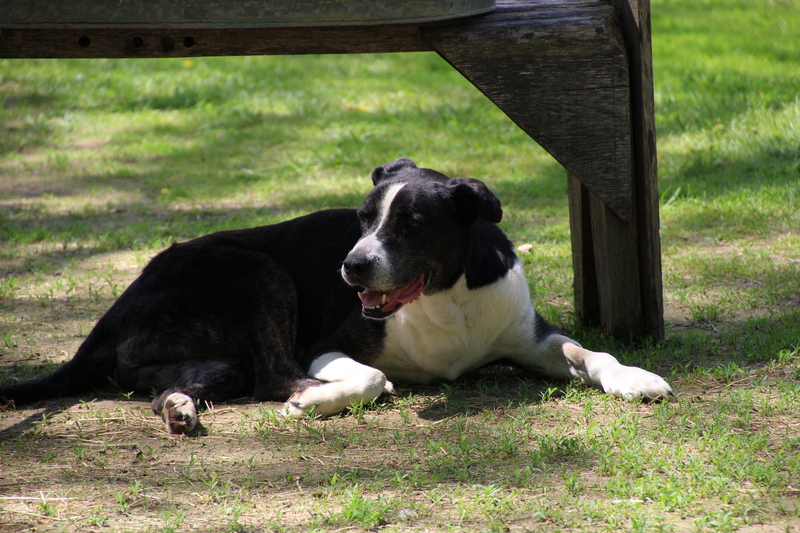 He was a great dog, a champion really, and took his job as complete overseer of the property with serious intention. Boreal was at least half Border Collie. Border Collie’s like to have a job. They tend to fret over things. They are more serious in nature than most other dogs. They are wicked smart. This was Boreal. He was devoted to us, to the farm, and to every creature who lived here. Every morning he would go out and patrol the entire 20 acres of our property. We know this because he developed a well-worn trail around the entire perimeter. He did the same thing every night before we went to bed. Often we would hear him barking off in the distance, no doubt warning any intruder that our property was off limits. Boreal came to me many years ago, almost 13 years ago, after I had lost another of our beloved Labs ( old age). This time, I figured I’d check out the shelter for a new dog. There he was, looking nervous and out of place, with sad eyes just begging me to give him a try. He’d been adopted and returned several times. Not because he had done anything wrong, but he wasn’t a squishy, cuddly kind of dog, and that happens to be what a lot of people are looking for. He was a serious dog. A thinker. A doer. He needed a job and he needed someone to love him for all of his amazing attributes. So, I took him home. At first he was a little nervous about this, he had left the shelter only to be returned a few too many times. Did I mention that he had lived in the shelter for almost two years? Did I mention that his future wasn’t looking so good? So off we went in my truck, me feeling pretty excited and him looking really nervous. I stopped briefly at the store for some gas. When I came out, he had chewed through three of my seat belts. He began looking even more nervous. I spoke to him in a kind voice, said “we’ll work on this” and drove on to the farm. When we got home, he was in between his constant state of nervousness ( he did recover from this condition) and astonishment. ” All these smells, all this room, all these critters to keep in place! !” He had found his home. I like to believe that he was so grateful for this chance of living that he made a pledge to watch over all of us for as long as he lived. He did this with intention, determination, no-nonsense, and with tremendous pride. He really was a champion of a dog, this Boreal. Once a visitor came to the nursery with a Griffin, the owner asked if he could let him out for a moment and assured us that he was a very well mannered and trained dog. Out he came and immediately spotted our free ranging chickens, and then…point and off he went. Boreal took off after him, caught up with him, gave him a good hit from the shoulder, which knocked the dog to the ground, and then he stood on him, looking back at us with an expression of ” get the hell over here, can’t you see this dog was going to eat one of our chickens!!”. Boreal did not like being in the house when we were outdoors and would do almost anything to get himself outside to be with us. He didn’t like to be cuddled, but he loved praise and belly rubs. If you went hiking he would always go on his own walk-about and might not return for hours later, he’d always know his way home. He was slightly particular about who he liked though he never bit anyone…he’d just ignore you. He seemed to always know how to adjust his behavior to each and every circumstance. He loved puppies. He ignored children. He loved to swim, he was scared to death of thunderstorms, and never got on the furniture. He was an independent sort of guy. He had an unbelievable understanding of vocabulary, we often had to spell words to avoid him knowing what we were up to. No matter how many times he came back from one of his daily patrols with a face full of porcupine quills, he never gave up trying to kill them. They just weren’t supposed to be tramping around on our farm. He meant business. So, if you are wondering why all of a sudden we have deer coming into the nursery, feeling like it’s o.k. to sample some of our hard work, it’s because Boreal is not around to keep law and order. We miss Boreal for all that he was….our serious, Dudly Do Right of a dog. Our champion nursery dog. Our beloved friend. As you can see from the photo ( our game camera) we have had some unwelcome visitors to the nursery. These deer are feeding under an apple tree that is barely twenty feet from the back of our barn. The lack of snow has given deer the ability to travel freely in search of food. This years heavy apple crop has been enjoyed by the deer in lieu of acorns and beechnuts that were scarce. This particular tree drops its apples late in the season well after the other trees have. In past years we have not had the deer come this close, but now that we are without a good nursery dog, this was bound to happen. While we enjoy all wildlife, deer especially have no place in a plant nursery just as a fox doesn’t belong in the hen house. As many of you know, deer can do a lot of damage to your landscape in a very short time. 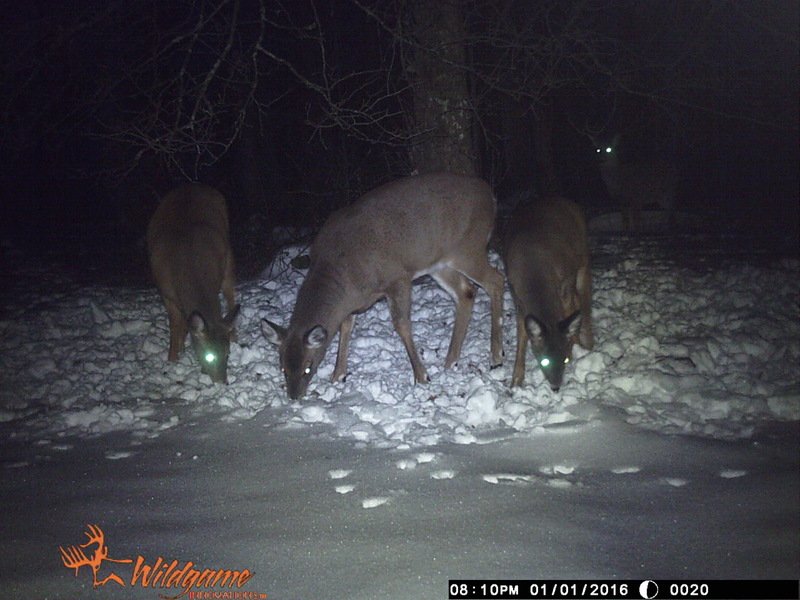 We will have to take measures to curtail them this winter if the snows doesn’t come to keep them in the woods.We are fortunate to live in such a wooded and rural area and that we can enjoy (and see) the wildlife that wander not far from this very homestead. We just prefer that they respect their boundaries. A lot to ask, we know. This being said, it is not surprising that our worlds overlap from time to time. Deer in the nursery, fox in the hen house, coyote contemplating how to get around the sheep fence. Yes, a plan will be made to keep the deer away from the plants we grow, but we wouldn’t want to change living amongst our wild neighbors. We will just kindly remind them to dine elsewhere. In times past, January 7th, the first free day after the twelve of Christmas was known as St. Distaff’s Day. It had no connection whatsoever with any saint but its place in the folk calendar gives an indicator of the importance of spinning at a time when this was the only means of turning the raw wool, cotton or flax into thread capable of being woven into cloth. The day, which was also know as Rock Day (referring to another name for either the distaff or the spindle) indicated that this was the end of the Christmas festivities and the return to the normality of spinning whenever there was a spare moment. As Anthony Fitzherbert, wrote in his ‘Boke of Husbandrie’ (1523) ‘it stoppeth a gap…it saveth a woman from being idle, and the product was needful’. Before the invention of the Spinning Wheel, spinning on what is known as the Drop Spindle (a pin or stick weighted by a whorl) was a slow and tedious task. 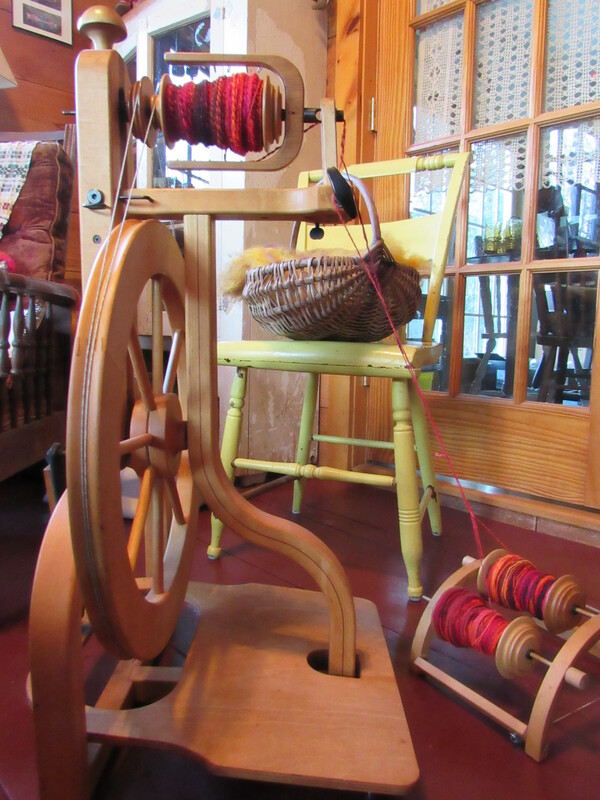 The spinning of one pound of woollen yarn could take about one week and one pound of heavy cotton yarn several weeks to spin. The method had not changed since the earliest times. There are images from as far back as time of the Ancient Egyptians showing how the distaff was used to hang the flax or tow and the spindle to effect the twisting. The distaff was carried under the arm, and the spindle left dangling and turning in the fingers below, and forming an axis round which to wind parcels of the thread as soon as it was made. Women of all classes would spin. Everyone from the Lady to the peasant was expected to spend time on the task, though the wealthier may have elaborate spindles. In the evening, after the chores of the day were done, there would be spinning, and the spindle would be taken to visit friends as the task could be undertaken at the same time as a conversation. The woollen industry became in the Middle Ages, the major industry in the land with huge areas gaining there main income from sheep. It is said that many of the elaborate churches in East Anglia, such as those at Long Melford and Lavenham, were financed from the woollen industry. In the 14th century, Edward III commanded that the Lord Chancellor should sit on a sack of wool – a reminder of the importance of the trade, for not only had home consumption increase but there was now a thriving export market. It was at about this time the spinning-wheels first started to appear, to replace the drop spindle. There are several depictions of women from this time using the spinning wheel – all show the woman standing at her work, moving the wheel with her right hand, while with her left she twirls the spindle. The introduction of this method speeded up the production of spun wool and the addition of the foot driven mechanism in the 1500s made even more of a difference. Isn’t there, can’t there be, shouldn’t we always look for…..those precious moments in the everyday? If I haven’t said it before, Happy New Year. Click on this to listen to some mighty fine words…. One of the least appreciated and misunderstood native shrubs are the sumacs. We have several stands nearby and appreciate what they offer the winter landscape. It is certainly a plant with many merits, both aesthetically and environmentally. Thought to be poisonous and invasive, these shrubs do have an important place in our native landscape and can have one in yours. 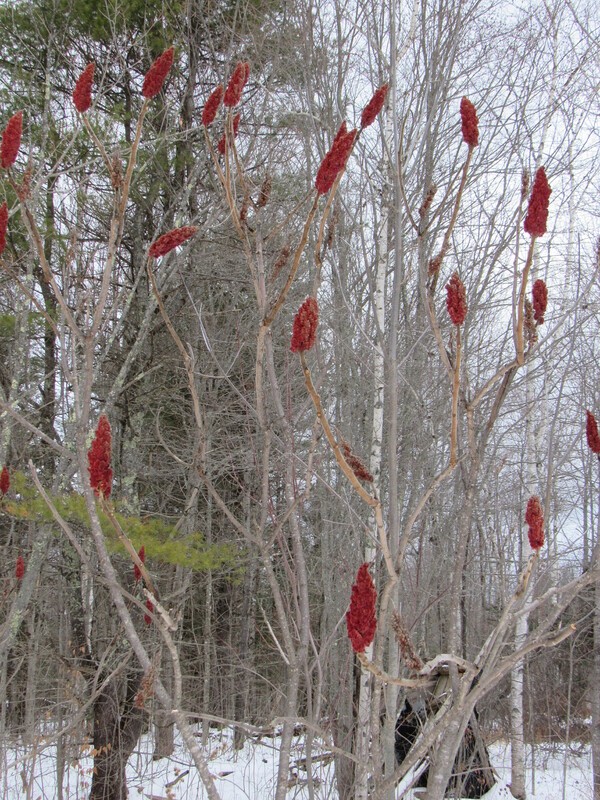 Staghorn sumac (Rhus typhina) and smooth sumac (Rhus glabra) are both widespread in Maine. Smooth sumac is the only shrub species found in all 48 contiguous states. Staghorn sumac getting its name from the velvet-like hairs on the new growth, and the smooth from the lack of it. Both grow in full sun to light shade and are drought resistant, being able to grow in drier soils. The bright red fruits appear in late summer and last through the winter providing important food for many species of wildlife. Chickadees, thrushes, cardinals, and pileated woodpeckers are some of the birds we see frequenting the grove of sumac at the farm, it is consumed by many other species as well…..like our healthy population of turkeys. In addition, they are larval hosts for the Hairstreak butterfly and attract native bees in large numbers.They also attract predatory and/or parasitoid insects that prey upon pest insects. Very good to know, yes? We can all use help with the pest insects we battle. Neither of the sumacs (Rhus typhina or Rhus glabra) are poisonous and in fact, the fruit can be used in many food and drink recipes and are high in vitamins A, C, and antioxidants. Ground sumac has become a popular spice in the culinary world. It has always been used in Mediterranean and Middle Eastern dishes, and is a key ingredient in the spice mix Za’atar. All it takes is a bit of promotion in a trendy culinary magazine, and a spice like sumac quickly finds its spot on our pantry shelves. Red fruited sumacs are not poisonous. Also, the other parts of the plant, as well as the fruit have been used medicinally as an astringent, for coughs, sore throats, and intestinal ailments. The berries, root, inner bark, and leaves can all be used to make dyes. We have used it for dying yarn and wool here at the nursery with great results. It really is a plant with many merits. As a landscape plant, they can be incredibly useful and easy. Yes, they spread and can cover large areas, but if you do have the space or a tough spot that would be difficult for many plants, it may be just what you need. Think of it as a tall (8-15 feet) ground cover. Tolerant of dry poor soils, great fern-like foliage, spectacular red and orange fall color that rivals the traditional autumn colors of our trees, and interesting form in the winter are all attributes that should be considered. Not to mention the benefits to wildlife and pollinators. There are cultivars available that do not spread as much and have interesting foliage forms and colors. 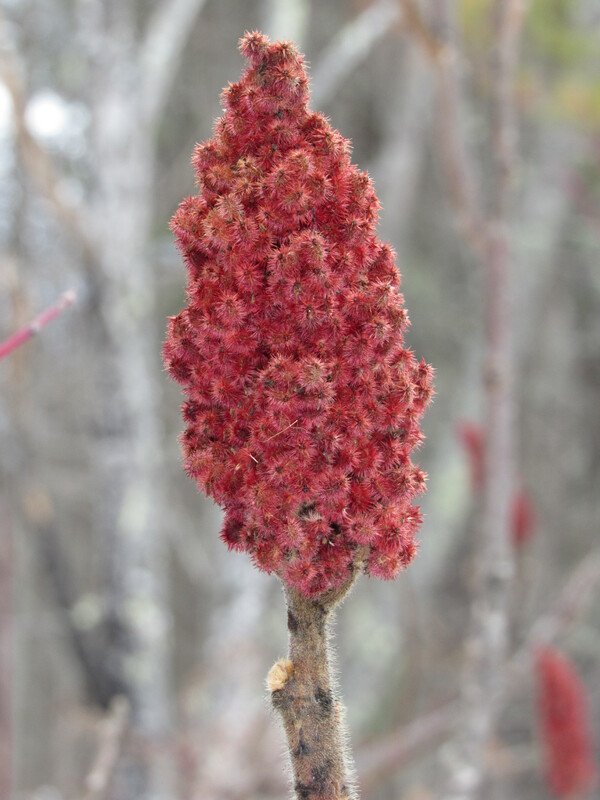 The next time you see sumac growing along the highway or in an open area, try to take in its beauty and uniqueness and not think of it as a large poisonous weed. 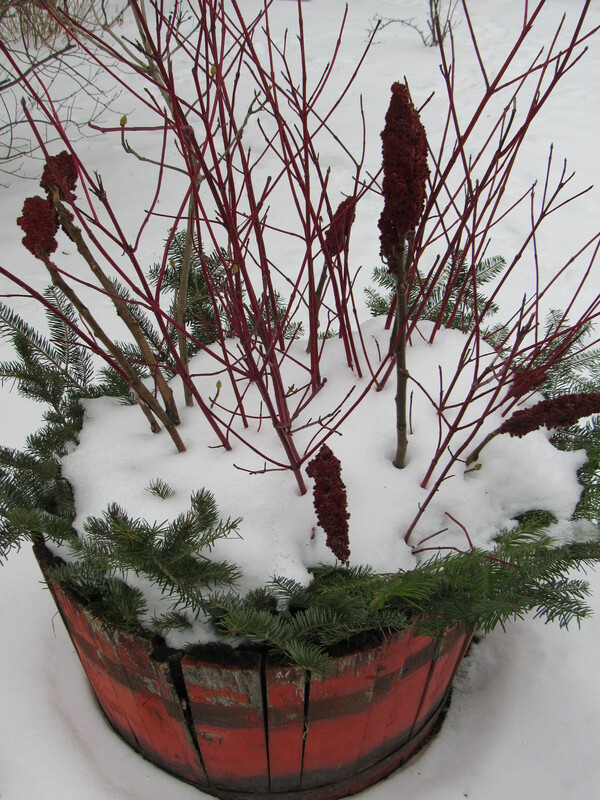 Just for fun……we’ll leave you with a recipe featuring the spice sumac. Enjoy! Preheat oven to 450°F. Lay cauliflower in roasting pan and coat with olive oil and heavy pinch salt. Roast until edges are nutty brown and paring knife inserted into cauliflower offers no resistance, about 30 minutes. Transfer cauliflower and remaining oil in pan to food processor along with cream cheese extra virgin olive oil, lemon juice, and sumac. Pulse until purée forms, leaving some small chunks of cauliflower intact. Add parsley and pulse until integrated. Adjust seasoning with lemon, sumac, and salt. Spread can be served warm, room temperature, or chilled. Sprinkle on extra sumac just before serving.